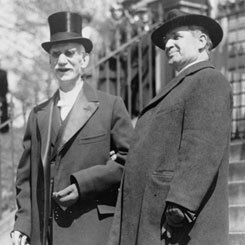 Image courtesy of Library of Congress In a rare photograph showing House Chaplains, Henry Couden (who served from 1895 to 1921; at left) and Chaplain James Montgomery (1921-1950; at right) stand outside the White House in 1921. On this date, Oliver Comstock of New York became the first and only former U.S. Representative to be elected Chaplain. Born in Rhode Island, Comstock moved to New York state as an adolescent. He entered politics when he served in the state assembly for two years. Elected to the 13th, 14th, and 15th Congresses (1813–1819), Comstock served on the Committee on Elections and the Committee on Pensions and Revolutionary Claims. An ardent advocate for veterans’ benefits, Comstock said they “have not wasted their time in the pleasures of the ball room, and in the amusements of fashionable circles, remote from fatigue, alarm, and conflicts . . . [t]hey have borne from the plain of battle the laurels of conquest; but have returned, seamed with scars, disfigured by frightful wounds, or deprived of their limbs.” In a number of petitions, Comstock asked the House to “place them above embarrassment, and enable them to support themselves, and those whom Providence may have committed to their care and protection.” Comstock left the House in 1819 to enter the ministry. After receiving his ordination, he served as pastor of a church in Rochester, New York, for nine years. Elected on December 20, 1836, with 103 votes on the third ballot, Comstock served for the remainder of the 24th Congress (1835–1837). Afterward, Comstock moved to Michigan, where he was a regent of the University of Michigan. He also served as state superintendent of public instruction. Comstock died in Marshall, Michigan, on January 11, 1860.